Why doesn't my camera like purples? I started my HAED. 14 rows so far and the picture doesn't do it justice. My boyfriend's hat kind of fell to the wayside. I did everything up until the last increase round. I'll get back to it soon. I spent money on stash this week. I bought 25 ct fabric for future HAED's as I know I'll need it. I also bought a 500g cone of black. It's approximately 264 skeins. I think it'll last me a while. Also picked up this chart and charms pack. 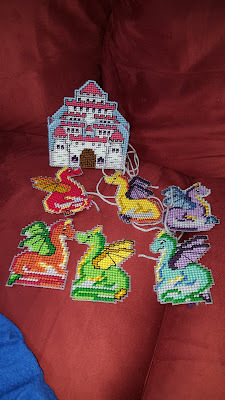 But the kit for the dragon coasters didn't provide enough thread for the colors needed to overcast the dragons. The castle is put together, but I ran out of the blue. 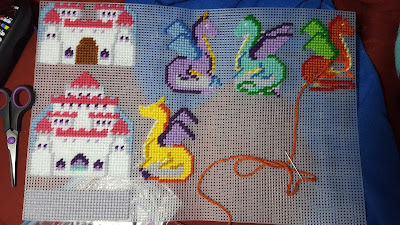 And I had 3 full lengths of the gray left for the dragons, but each will take at least an entire length. I emailed Herrschners to see if they could send me the missing yarn. In the meantime I've started crocheting a hat for my boyfriend and kitted up a HAED for their Challenge #4, Alternative Reality. I continued to work on the dragon coaster set this week. 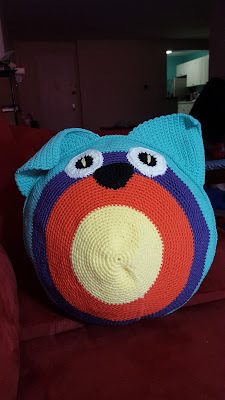 So I started to make the other owl pillow. Managed to get one side done after modifying the ears slightly. But doing plain rows was getting annoying to me. So I switched to plastic canvas coasters. And since I have a code for 20% off a HAED purchase, I need to figure out what patterns of my 800+ wishlist I want. Oh boy. Happy New Year! Today is the start of a new year of craft projects. 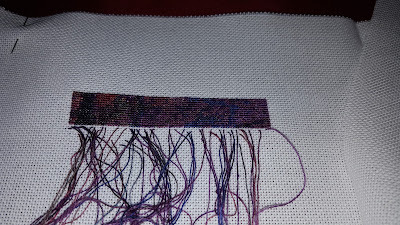 And I already have my first finish. 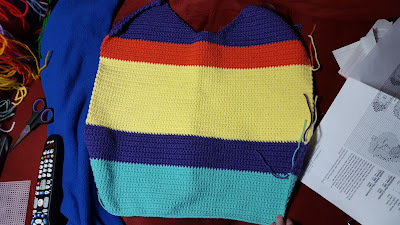 Currently working on the square sibling. May buy a pillow form and stuff around that.